The glucose test (FBS test) measures the glucose blood level. The glucose test, also known as an FBS test, measures the glucose blood level. Why is the FBS test important? The FBS blood test (fasting blood sugar test) is frequently used as a diabetes screening test. This Glucose Test is a blood test. The glucose test, also known as a fasting blood sugar test, glucose blood test, FBS blood test and an FBS lab test, measures the glucose blood level. Glucose is a compound that serves as one of the primary fuels for tissues and cells in the body. Glucose is derived as an energy source from food. Glucose can be utilized, stored or excreted by the body. Low glucose levels can lead to confusion and altered mental status - a condition which can be fixed by rapid administration of glucose. High glucose levels can lead to diabetes, a chronic condition associated with a number of long-term health issues. The glucose test is an important screening test for diabetes. It is sometimes known as an FBS blood test because it is usually performed after an 8-hour overnight fast. The glucose blood level is frequently used by diabetics to manage their medications and by people in general who want a basic screen for diabetes. Technological innovations over time have made the FBS test more accessible by allowing people to check their blood glucose levels using a home device called a glucose meter and a drop of blood from one's finger. However, some people prefer to get their glucose test done at a lab to avoid user error or because they want to get other diabetes lab tests at the same time such as the hemoglobin A1c test concurrently (all part of the diabetes screening panel). While the glucose blood test is a useful screening tool, it does represent one's glucose level at only one point in time. As a result, the glucose test result cannot tell if one's glucose is spiking throughout the day but happened to be normal at the time of testing. Fortunately, other lab markers can help clarify what is happening to the blood sugar level at other times. The hemoglobin A1c and fructosamine tests can give one a better picture of the average blood sugar over different periods of time. For even more data, the newer GlycoMark test was designed specifically to help assess glycemic variability and the tightness of blood sugar control over time. The glucose test also plays a role in other tests. For example, the blood glucose level is measured as part of the glucose tolerance test during which an oral solution is administered and blood glucose levels are measured to understand how quickly the body can clear glucose out of the bloodstream. To get a glucose test near you at a Quest Diagnostics lab, simply order online and get your blood drawn at your selected lab. Once the glucose lab results are ready, they will be available for download. 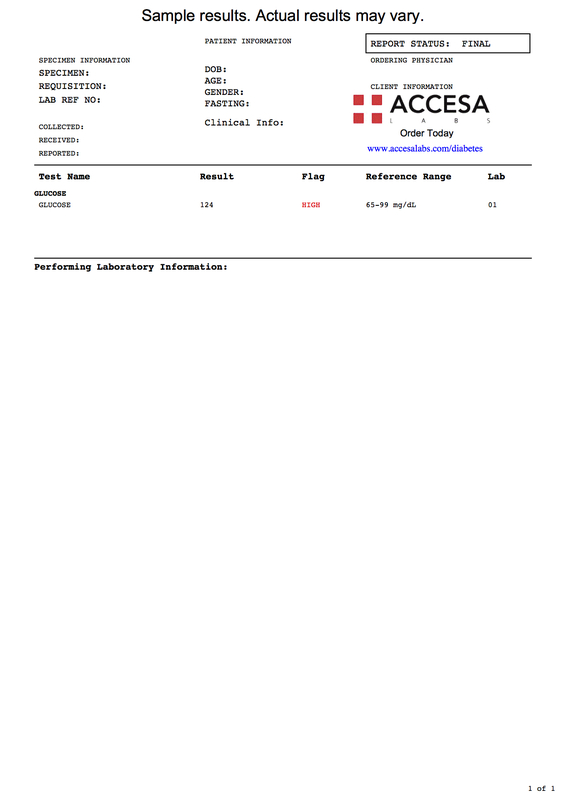 As can be seen on the sample glucose lab report above, the blood glucose level will be reported as a number and can be compared against the reference range provided by the lab. Additionally, many people track their glucose blood levels over time, particularly if getting glucose lab testing in the setting of diabetes. Glucose Test at Guaranteed Prices.